We’d love your help. Let us know what’s wrong with this preview of Tribal Affairs by Matt Dallmann. To ask other readers questions about Tribal Affairs, please sign up. I thought this was an interesting novel, though not what I had expected. In the beginning, I was confused with the switching narration and trying to understand what was going on. It became more clear what was happening the more I read, but I never fully connected with any of the characters. Still, this was a entertaining story and one I'm glad to have read. If you enjoy YA fantasy, and the description sounds good to you, I think you should give it a read. The story alternates between the tale of Dahlia and Liana, a genie and a teenager in the present. The shift in the story was kinda abrupt and hard to grasp initially, but later on, it becomes better. The conversations and the writing style is easy to follow, given that it is primarily aimed at the YA crowd. But Tribal Affairs might suit to all age group alike. There are a few moments in the story that you might feel outta place if you had jumped in thinking only of Aladdin's Genie.The Djinn/genie world seems much more complicated than that. They have even feuds between their tribes (thus the name Tribal Affairs, get it?) and lots of restrictions on their power. So much for the shape-shifting goofy genies! *sobs* *sobs*. But kudos to the strong world building that even a genie noob like me could understand. I just love when a book exceeds my expectations. This book is solid. At first glance when you read this book summary, you may think "fantasy". Yet, this book is more than just "fantasy". It kind of dealt some into the mental psyche as well. Liana and Taffi were great main characters. They were relatable and engaging. Both the young and adult readers will enjoy this book. Plus, the other characters and locations that Liana and Taffi met and visited along the way were cool. There was more to Liana I just love when a book exceeds my expectations. This book is solid. At first glance when you read this book summary, you may think "fantasy". Yet, this book is more than just "fantasy". It kind of dealt some into the mental psyche as well. Liana and Taffi were great main characters. They were relatable and engaging. Both the young and adult readers will enjoy this book. Plus, the other characters and locations that Liana and Taffi met and visited along the way were cool. There was more to Liana. As the story progressed, these attributes were revealed. There was a romance between Liana and Taffi but it was not the main strong focul point of the story. I liked this as it did not distract from the overall story. There were moments within the story where it would flash into the past. These moments helped add to the present and the connection between Liana and the bracelet. This was such an easy, smooth read. I finished this book in one day. I look forward to reading more books from Mr. Dallman. I received a complimentary copy of this book for honest review. Tribal Affairs was different than what I usually read. And what I mean by that is the style of writing. It's told 'fly on the wall' style (third POV), but in the present-tense. That's amazing. Few authors write this way, and when I find them, I always love it. Liana was well thought out, Dahlia was fascinating. The way Dahlia projected her emotions to Liana was awe-striking. Very well written. Easy to read and understand. I won the paperback of this book in a competition I entered because I was intrigued by the idea of a story involving genies. The tale starts with Dahlia, a genie trapped inside a locket. Unsuspecting Liana wears the locket around her ankle, as did her now deceased mother. But Taffi isn’t a figment of her imagination; he’s a genie. I won’t go into a I won the paperback of this book in a competition I entered because I was intrigued by the idea of a story involving genies. The tale starts with Dahlia, a genie trapped inside a locket. Unsuspecting Liana wears the locket around her ankle, as did her now deceased mother. Tribal Affairs tells the story of fantasy, magic and genies. Dahlia, a genie who finds herself locked away in a locket that teenager Liana now possesses. This locket causes a ripple effect for many of the characters within the book. Especially, for Liana and Taffi, the son of Dahlia's enemy, Stefan. Even thought it is not my normal genre I read, I thought Tribal Affairs was a pretty good book. There is a few main elements of all things I love to read in a story: mystery, suspense, history, roman Tribal Affairs tells the story of fantasy, magic and genies. Dahlia, a genie who finds herself locked away in a locket that teenager Liana now possesses. This locket causes a ripple effect for many of the characters within the book. Especially, for Liana and Taffi, the son of Dahlia's enemy, Stefan. Even thought it is not my normal genre I read, I thought Tribal Affairs was a pretty good book. There is a few main elements of all things I love to read in a story: mystery, suspense, history, romance and mystique. It is not a long story, so it took me no time to finish it in one sitting. I have to admit, I was a little confused at what was going on at first, but it quickly came together for about 25% into it. It held my attention from then on and I did not want to put it down. I had to know what would happen next for Dahlia, as well as, Liana and Taffi. There are a few twists and turns I did not expect. Ines that I could not have predicted. It was fascinating how it all came together in the end. I give Tribal Affairs four stars. I am interested in reading more by Matthew Dallmann in the future. I am adding him to my list of must read authors. I recommend Tribal Affairs for those who enjoy a good, entertaining, fun and quick young adult fantasy for all ages. Most definitely worth a read. Beautiful and simply written. Loved the characters and how the actions were described. The travel between past and future was so smooth and not forced. 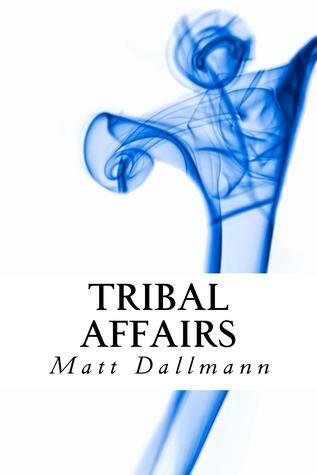 I found Tribal Affairs by Matt Dallmann to be a rather surprising read. It was very different from what I’d been expecting. It had an attention-grabbing premise and the genie mythology was well described. I liked how we got the story from the genie Dahlia’s perspective- which was very unique since she was trapped in a locket. I was interested in the mystery of Dahlia’s past, and learning how she ended up trapped in the locket in the first place. Liana and Taffi had a different and sometimes amus I found Tribal Affairs by Matt Dallmann to be a rather surprising read. It was very different from what I’d been expecting. It had an attention-grabbing premise and the genie mythology was well described. I liked how we got the story from the genie Dahlia’s perspective- which was very unique since she was trapped in a locket. I was interested in the mystery of Dahlia’s past, and learning how she ended up trapped in the locket in the first place. Liana and Taffi had a different and sometimes amusing relationship, but sometimes they seemed more like siblings than love interests. The story was filled with vivid imagery, and often times were quite jocular. The dialogue was engaging, but there wasn’t much character development. Also at some points in the story I was completely lost as to what was going one. Like there was this scene where there were headless camels running around and causing havoc. I’m still scratching my head over that one. On a whole this was an original, clean fantasy. I received a copy of this novel for free. I was not required to post a positive and all views and opinions are my own. “A huge shoutout to the author for sending a paperback all the way from US in exchange for a honest and unbiased review. The Book was all intact and alive with its glossy softy cover. This review is done as part of the book review program of Ireadbooktours. Tribal affairs is a tale of centuries old dispute between two ancient tribes of djinn or genies, Marid and Ifrit. Marid’s being the most powerful among the 5 tribes of genie, they are genies who like humans whereas Ifrit are the shrewd types who manipulate humans and outwardly hate them. ‘Dahlia, a centuries old genie, lies hopelessly trapped in a damaged golden locket charm attached to an ankle bracelet. Its owner, sixteen-year-old Liana, wears it for the first time during her father Jamison’s opening night illusion spectacular. Not only does its presence cause Jamison to folly his performance, but it also starts a chain of bizarre events that lead to a showdown with Dahlia’s mortal enemy, Stefan, and an unsuspecting romance between Liana and his son’. Dahlia, Liana, Taffi, Stefan, Jamison and Amon. To simply put it, Dahlia is a centuries old MARID genie trapped in a golden locket and the locket belongs to liana’s late mother which now she’s wearing as an anklet bracelet. The wearing of the locket starts a chain of bizarre events in liana’s life. As the story progresses she finds herself in a different magical world, not just that, she realises that her arrival was awaited from centuries where now she is prepared for a showdown with Dahlia’s mortal enemy Stefan. With this, there is another main character Taffi, Stefan’s son, who plays an important role in this genie conflict tale. I loved the book’s different and fresh take on magical fantasy choosing a plot around genies as we all have a childhood fantasy of genies who turns our wishes into reality with just a command. The narration was indeed good and the language as easy as it could be. Though initially i couldn’t get myself to start reading it as I didn’t know what to expect from a story of genies. But once i was on it, it didn’t feel even once like it was overdone or too much or clichéd. The story was modern unlike what you would expect from a genie story as the plot starts with the main protagonist 16 year old liana, a college goer staying with an aged father, who is a professional magician, trying to make a living out of it. It was only a few chapters down the line, i found myself hooked to the story and i mean completely hooked and also i had difficulty recognizing dahlia’s and liana’s dialogues apart. There were times i thought it was liana thinking when it was actually dahlia and vice versa, as both their character’s and pasts had many similarities. I loved all the magical sequence in the story. The love story of Dahlia and Alexander was as beautiful as liana’s and Taffi. There were quite a few lines i found catchy and one of them being, “Through all our travels and tragedies, we had seen both the dark and the light in each other’s eyes and still chose to stay” which perfectly sums up their love for each other. This is a story full of fantasy, mystery and suspense woven around a thwarted romance. Dahlia is a genie who has been trapped in a locket on an ankle bracelet. Liana’s mother apparently died from mental illness and now sixteen-year-old Liana has decided to wear the ankle bracelet. She has no idea the significance of the locket which soon brings chaos into her life. Liana begins dreaming strange dreams of star-crossed lovers. Then she begins to see images. Before long her father thinks she needs m This is a story full of fantasy, mystery and suspense woven around a thwarted romance. Dahlia is a genie who has been trapped in a locket on an ankle bracelet. Liana’s mother apparently died from mental illness and now sixteen-year-old Liana has decided to wear the ankle bracelet. She has no idea the significance of the locket which soon brings chaos into her life. Liana begins dreaming strange dreams of star-crossed lovers. Then she begins to see images. Before long her father thinks she needs medical help like her mother did. But Liana is convinced that there is something stranger – and more real than she can understand – going on. She meets a strange young man named Taffi, which is the same name as the horse in her father’s illusion act. Is Taffi really a genie as he claims? Is he there to help her or hurt her? Are they both a victim of a curse or is it all a delusion or hallucination? The world of genies created by the author is fantastical, full of magic, power, jealousies and beasties. The reader quickly learns there is a connection between Dahlia and Liana but there is a long path of adventure and danger to reveal the details. The genies intrigues and relationships are similar to human although they seem larger due to the powers the genies can use. They also seem more dangerous and less benign than one might think a genie would be. The author uses an interesting approach by having Dahlia narrate the story at first. However as chapters progress, the point of view shifts to third person. Later it is clear that Dahlia is narrating again. I often have the Kindle reading to me, so I had to keep close track of whose feelings were being described since Dahlia should have been describing observations of other’s expressions and actions rather than describing their internal feelings. This caused some confusion for me which was a little distracting. Although, thinking back, I think perhaps Dahlia could read the thoughts of the others. Still, it created some confusion. In spite of that, I enjoyed the fantasy journey and the strange creatures along the way. I especially liked the sea creatures from one of the genie worlds. There is a tentative, stumbling romance including appropriate teenage angst. It was interesting to read the emotional growth of the characters. I recommend this to readers who enjoy fantasy and a light YA romance. When Liana finally gathers the courage to wear her late mother’s anklet, her whole world starts to change. First, there’s an accident at her father’s magic show, then she starts having the strangest dreams, and soon she’s seeing people that no one else can. Her shrink tells her she’s going crazy, just like her mother, but the boy no one else can see keeps insisting that everything happening is real. After being trapped in an anklet for centuries, Dahlia is so close to gaining her freedom she ca When Liana finally gathers the courage to wear her late mother’s anklet, her whole world starts to change. First, there’s an accident at her father’s magic show, then she starts having the strangest dreams, and soon she’s seeing people that no one else can. Her shrink tells her she’s going crazy, just like her mother, but the boy no one else can see keeps insisting that everything happening is real. After being trapped in an anklet for centuries, Dahlia is so close to gaining her freedom she can taste it. She needs Liana’s help to defeat the genie who trapped her in the anklet, but Dahlia’s mortal enemy isn’t going to give up that easily. Just as Liana gets close to the truth, he curses her and sets Liana on an adventure that will take her to the land of the genies and back, and eventually bring her face to face with the man who ruined both her and Dahlia’s lives. But this time she’ll be ready. Overall, I enjoyed this book. It was very fast-paced, and I was never bored. I was fascinated by the places the author created and the creatures that accompanied them. At times, I was a little confused by the sequence of events and the characters’ emotions, but it didn’t detract from the storyline. I appreciated all the twists and turns that made the story both unpredictable and interesting. Throughout the book, Liana struggles with whether she’s strong enough to accomplish her goal, which is something many of us are familiar with. I especially enjoyed her character development as she learned just how strong she truly was. Readers of all ages can relate to Liana and those who accompany her as they juggle love, loyalty, and trust in this exciting fantasy novel. I would recommend this book to anyone who is interested in genies and magic or is interested in a fast-paced read with plenty of twists and turns. Tribal Affairs is a YA novel that revolves around the lives of Dahlia, a centuries old genie, trapped in an ankle bracelet, and a sixteen year old girl, Liana. Liana wears the bracelet for the first time on the opening night of her father's performance. Little does Liana know that this small act will have much bigger consequences. The story is written in two different points of view, one telling Dahlia's story through dreams that Liana has, the other are Liana's version of the events that unfold. Tribal Affairs is a YA novel that revolves around the lives of Dahlia, a centuries old genie, trapped in an ankle bracelet, and a sixteen year old girl, Liana. Liana wears the bracelet for the first time on the opening night of her father's performance. Little does Liana know that this small act will have much bigger consequences. The story is written in two different points of view, one telling Dahlia's story through dreams that Liana has, the other are Liana's version of the events that unfold. Matt paints a pretty informative picture of the genie world, how they live, the extent of their powers and the various tribes that exist. We also come to know of their differences in personalities and how they look upon humans. At first it was a little difficult to catch on to the changes in narration and the sequence of events, but as the story progressed, the characters became familiar and slowly the plot started to make sense. Through all this, Liana discovers her ancestral connection to the genie's and embarks on a journey with Taffi, a genie who turns up at her house and who claims to want to help her. It is only later that she discovers the connection between Taffi and Stefan, the person who is solely responsible for the event that set the rest in motion : the trapping of Dahlia. Additionally, Liana works to find within herself her powers and strength with the help of Taffi and her great great great great.... something grandfather, Amon. The story is simple and a fast read. It flows easy and there isn't anything complicated that we need to focus hard to understand. It is an interesting read and though I did not connect with some characters, Liana and Dahlia truly left an impression on me for their strength and ability to love so deeply as well as their compassion. Dahila is a genie who has been trapped for years inside of a stone, a consequence for the sin of loving a human. In the present-day, 16 year old Liana decides to wear her mother's charm bracelet for the first time since her death. Liana's mother had schizophrenia and ever since putting on her mother's charm, Liana has begun to see things, hear things and has been having strange dreams. In Liana's dreams, Dahlia is telling her a story, the story will help set Dahlia free, but it will also help ke Dahila is a genie who has been trapped for years inside of a stone, a consequence for the sin of loving a human. In the present-day, 16 year old Liana decides to wear her mother's charm bracelet for the first time since her death. Liana's mother had schizophrenia and ever since putting on her mother's charm, Liana has begun to see things, hear things and has been having strange dreams. In Liana's dreams, Dahlia is telling her a story, the story will help set Dahlia free, but it will also help keep Liana safe from Stefan. Stefan is another genie, an enemy to Dahila and now Liana. Liana soon meets Taffi, Stefan's son and together they enter the world of the genies and a tribal feud that has been raging for centuries. Tribal Affairs is a book following Liana and her magical adventure. Liana is a normal girl, or so she thinks. Her early life has been okay; her mother was crazy, her father is the best father in the world. One day, Liana decides to put her mother's old locket around her leg when she goes to her father's magic show. At the show, a freak accident happens, leaving her father as the laughingstock of the town. Afterward, she starts to see glimpses of "something" messing with her father. A few days la Tribal Affairs is a book following Liana and her magical adventure. Liana is a normal girl, or so she thinks. Her early life has been okay; her mother was crazy, her father is the best father in the world. One day, Liana decides to put her mother's old locket around her leg when she goes to her father's magic show. At the show, a freak accident happens, leaving her father as the laughingstock of the town. Afterward, she starts to see glimpses of "something" messing with her father. A few days later, she is able to fully see that "something," and it's a mischievous genie with a familiar tattoo on his shoulder! Later, she realizes she's seen that tattoo on someone else before. Liana goes to find him to understand who he is. Little does she know, the other genie is evil and curses her to make her invisible to all humans. Now Liana must set out on a long journey in order to become whole again. Will Liana be able to make herself visible again? Can she defeat the evil genie? Find out in this great book! Matt Dallmann wrote an interesting book filled with magic and genies. This book was enjoyable and fun to read. However, some parts were slow. For the most part, the scenes worked well together and flowed smoothly. The author incorporated unique ideas into this story. For example, the method of "trapping" a genie in this book was different than other methods I've read about. This method seemed more logical than some of the other theories I've read. I would recommend this book for ages 12 and up because there was some death. Tribal Affairs gives Teen & Young Adult a fantastic Paranormal & Urban fantasy. Author Matt Dallmann gives the YA Readers an easy to follow storyline with G rated content that a parent of a teen would be happy with, the book quickly jumps into the adventure to keep the reader's attention, it does alternate from past to present, between the tale of Dahlia and Liana a genie and a teenager. Tribal Affairs tells the story of fantasy, magic, and genies. Sixteen-year-old Liana decides to wear Tribal Affairs gives Teen & Young Adult a fantastic Paranormal & Urban fantasy. Author Matt Dallmann gives the YA Readers an easy to follow storyline with G rated content that a parent of a teen would be happy with, the book quickly jumps into the adventure to keep the reader's attention, it does alternate from past to present, between the tale of Dahlia and Liana a genie and a teenager. Tribal Affairs tells the story of fantasy, magic, and genies. Sixteen-year-old Liana decides to wear charm (ankle bracelet) which, unknown to her, is the prison for a centuries-old genie, Dahlia. The charm has a ripple effect for many of the characters within the book. The genie has been trapped for generations in the charm of an anklet that once belonged to Liana's mother. Soon she finds herself caught up in a centuries-old conflict between two powerful tribes of genies. The main characters come from very different worlds, which you read when it's going from past to present and they have very different backgrounds. I look forward to reading more books from Matt. Dallman. This was a very intriguing concept that did not unfold predictably. It was surprising in almost every way when I was reading it. I love the simplicity of the Book Cover and the intricate way it was written. Descriptive and Emotional throughout with plenty of action and even romance laced in between. I think this is a great novel for the genre, it fits in perfectly and I think any YA Fantasy fan will enjoy it! This novel had a powerful main character and a powerful underlying theme of actions and consequences. I liked the way the author set up the novel and that he made sure to give the reader plenty of information so that they came to understand the world he had created. I liked that this novel is written for Young Adult readers, but can be enjoyed by all fans of Fantasy. This book well… I do not know where to begin. So I guess Welcome to my stop on the blog tour of Tribal Affairs by Matt Dallmann. In an ever tightening weave of two stories, this is a fantasy with much more than just magic. Sixteen-year-old Liana decides to wear an anklet bracelet, which, unknown to her, is the prison for a centuries-old genie, Dahlia. As Dahlia projects her feelings and thoughts, Liana is sure she's going insane. But when Liana wears the anklet to her father's show, unexplained and unexpected things happen. Soon Liana finds herself caught up in a feud between two genie families, and falling in love for the In an ever tightening weave of two stories, this is a fantasy with much more than just magic. Sixteen-year-old Liana decides to wear an anklet bracelet, which, unknown to her, is the prison for a centuries-old genie, Dahlia. As Dahlia projects her feelings and thoughts, Liana is sure she's going insane. But when Liana wears the anklet to her father's show, unexplained and unexpected things happen. Soon Liana finds herself caught up in a feud between two genie families, and falling in love for the enemy's son. After reading the blurb, I was looking forward to reading this one and was not disappointed. This book isn't only about the fantastical world of genies and granting wishes, but hits a more emotional level as well. It starts with two stories: that of Liana and that of Dahlia. They both come from very different worlds, have very different backgrounds, and yet discover a way to connect. The tale switches alternately between the two, beginning with two threads and, as the book continues, slowly weaves the two closer together until they meet for one wonderful, exciting ending. The book holds a steady pace, never drifting into long-winded explanations or descriptions. Every scene sits and carries the action along. It's not always high-tension, but it's still grabbing and makes this a tale hard to put down. It's easy to get lost in Liana and Dahlia, and sympathize with them. The other characters do not share this same depth and come across shallow. But this doesn't disrupt the flow. There is a lovely romance, which adds a nice amount of warmth and interesting twists, but it never overtakes the main plot or comes across cliche. It's appropriate for even the younger end of the YA audience, but then the entire read will work for more gentle readers too without losing the excitement fantasy friends enjoy. Summed up, this is a refreshing twist on genies, which YA fantasy friends are sure to enjoy and even see a bit of themselves in the characters. Tribal Affairs offers a YA-friendly look at genies. I have only read a couple of books focused on genies--so, I am not very familiar with their world. This book offered enough details and world building that I developed an understanding of the genies and their tribes without feeling overwhelmed or confused. The book is truly written for a young adult audience (even tween/ young teen readers) with it's easy to read, easy to follow storyline and G rated content. Readers should expect some sudden sh Tribal Affairs offers a YA-friendly look at genies. I have only read a couple of books focused on genies--so, I am not very familiar with their world. This book offered enough details and world building that I developed an understanding of the genies and their tribes without feeling overwhelmed or confused. The book is truly written for a young adult audience (even tween/ young teen readers) with it's easy to read, easy to follow storyline and G rated content. Readers should expect some sudden shifts in the story. The author's writing style builds his fantasy world with chapters alternating between Dahlia (as recollections from the past) and Liana (in the present). It took me a few chapters to settle into this flow. Then, only a few chapters later, there was a sudden shift in the storyline, and we were off on a full-blown adventure. That first sudden shift set the stage for the remainder of the book--but, I was hit with a lot of new things quite suddenly. The next major shift nearly made me set the book aside. Again--the second sudden twist was necessary to the book, and the reasoning and logic unfolded over the remaining chapters. It was just a sudden, unexpected shift that didn't seem to fit my vision of the book. Having said that; the author did a great job moving the story beyond each twist and pulling the reader back into the context. Would I recommend Tribal Affairs by Matt Dallman? I did enjoy this book--and the author was able to keep my attention through to the very end. I did have a few, "What just happened?" moments--but, the author pulled me through those very well as he progressed the story. The book is a quick, easy read with a lot of elements happening at once bridging the human world and the genie world. Readers will find some reality along with the fantasy in this book--yet some things seemed to catch the reader by surprise. I would recommend it to readers who prefer more clean fantasy novels and fans of young adult fiction. She thought she was losing her mind ~ that she was seeing things. But the truth was even more unbelievable ~ Liana unknowingly has connected herself to a genie. This genie has been trapped for generations in the charm of an anklet that once belonged to Liana's mother. And now Liana is about to discover the truth she knew is not the truth that is. When Liana decides to claim the anklet as her own to wear she unwittingly triggers a chain of events which upend her life and everything she believed was true. Soon she finds herself caught up in a centuries-old conflict between two powerful tribes of genies. And Liana's only hope of understanding exactly what is happening to her lies with a young genie who is partially responsible for the whole mess she now finds herself in. But can Liana trust Taffi with her life and her heart? Or will he prove a true son of his father and an enemy to Liana and her family? But this is more than Liana's story as Dahlia's story is told as well. Who is Dahlia you ask. She is the genie that has been trapped within the locket which Liana is wearing. And Liana and Dahlia's stories are told in an alternating fashion until they come together in a climactic conclusion. If you are a fan of fantasy and like it clean this is a book you'll want to pick up and enjoy. Though marketed to the YA reader I feel any fantasy fan 13 or 14 and up will enjoy this book. The pacing doesn't drag and the action and danger is a steadily building force throughout. And the author's ability to draw all these threads together comes to a satisfying story that ends in a way so that the reader is not left with any unanswered questions. One could definitely describe this contemporary fantasy novel an odd duck. Several chapters an unidentified female character narrates, who has a husband named Alexander. For most of the story, chapters appear to be in third-person, with the main character being Liana, daughter of the magician Jamison the Great, one of whose performances has a misfire early on. In another dream-dedicated chapter, Alexander hangs beaten and upside-down from a tree, with the narrator soon saying that she has influe One could definitely describe this contemporary fantasy novel an odd duck. Several chapters an unidentified female character narrates, who has a husband named Alexander. For most of the story, chapters appear to be in third-person, with the main character being Liana, daughter of the magician Jamison the Great, one of whose performances has a misfire early on. In another dream-dedicated chapter, Alexander hangs beaten and upside-down from a tree, with the narrator soon saying that she has influence over Liana’s dreams. Liana is still a student in grade school, with a few classmates pranking a slide presentation by including pictures of her father’s failed performance. She is a troubled pupil, under the care of a psychiatrist named Dr. Rattner, who suggests medicating her. Liana quickly finds herself thrust into a fantastical world inhabited chiefly by genies, with one named Stefan serving as something of an antagonist later on. The author divides genies into a few tribes, such as the Marid and Ifrits in a reflection of real-life djinn mythos that adds well to the narrative. Liana and a friendly genie, Taffi, male, set off on a ship called The Drunken Maiden, with Liana urged to keep control of her supernatural abilities, and while the action isn’t exactly on an epic scale, there is some revelation towards the end, such as who exactly is narrating the story, which accounts for an overall satisfying yarn. There are some derivative aspects such as an apparent inspiration by the Star Wars franchise, and the author does err in mentioning witch burnings regarding the Salem Witch Trials (where no alleged magicians were incinerated), but the book is otherwise recommended. Dahlia is a genie that has been trapped in a locket on an anklet. Liana is the 16 year old that has decided to start wearing the anklet of her mothers. But when she does, she starts hearing voices, having strange dreams, and when she attends one of her father’s performances things go wrong. Liana and her family think there is something wrong and want to medicate her. But the truth is that Dahlia is trying to communicate with her. Dahlia has a history of a feud with another genie family that has Dahlia is a genie that has been trapped in a locket on an anklet. Liana is the 16 year old that has decided to start wearing the anklet of her mothers. But when she does, she starts hearing voices, having strange dreams, and when she attends one of her father’s performances things go wrong. Liana and her family think there is something wrong and want to medicate her. But the truth is that Dahlia is trying to communicate with her. Dahlia has a history of a feud with another genie family that has lasted centuries. Liana is drug into the middle of this feud and finds herself falling for Taffi, the enemy’s son. I really liked this story. You will alternate between Dahlia and Liana’s stories. I really enjoyed the description that went into the genies history. Although both women are from different times I really enjoyed how they managed to work together. You can’t help feeling for both women, although ages apart they both have troubles to bear. There is a little romance with Liana and Taffi but it was written so it doesn’t take away from the story. I think this is a great story of genies. I have not read many stories about them and I really enjoyed this one. I think if you like fantasy you should check out this book. It will not be what you expected and you will really like it. I received Tribal Affairs from iRead Book Tours for free. This has in no way influenced my opinion of this book. Dahlia is a centuries-old powerful genie, who is helplessly trapped in a damaged golden locket. The locket is a family heirloom that was passed on to Liana by her beloved dead mother. She wears the locket during her father, Jamison's opening night performance. The locket causes a chain of unfortunate events which leads to a showdown between Liana and Dahlia's nemesis, Stefan. Will Liana be able to defeat Stefan? Will Dahlia be able to escape her prison? I found the novel to be an interesting rea Dahlia is a centuries-old powerful genie, who is helplessly trapped in a damaged golden locket. The locket is a family heirloom that was passed on to Liana by her beloved dead mother. She wears the locket during her father, Jamison's opening night performance. The locket causes a chain of unfortunate events which leads to a showdown between Liana and Dahlia's nemesis, Stefan. Will Liana be able to defeat Stefan? Will Dahlia be able to escape her prison? Dahlia’s story is told mostly through Liana’s dreams. As the dreams progress, at some point Liana realizes that they’re not dreams I chose to read this book after receiving a free copy. All opinions in this review are my own and completely unbiased. The beginning of the book was very confusing, but as I kept reading, the story did unfold. My first mistake was thinking that Taffi was a horse. It was clear after the first chapter that he was a young lad. Yes the book is for YA young fans, but I did enjoy it. It did need more descriptions in some of the parts, you were left in places. You finally could catch up later. I would recommend this to any young fantasy fans. It has adventure, fantasy, love and hate. If you like genies, you will love th The beginning of the book was very confusing, but as I kept reading, the story did unfold. My first mistake was thinking that Taffi was a horse. It was clear after the first chapter that he was a young lad. Yes the book is for YA young fans, but I did enjoy it. It did need more descriptions in some of the parts, you were left in places. You finally could catch up later.